Pony FVC Finishing Table from Gillmans Commercial Appliances. 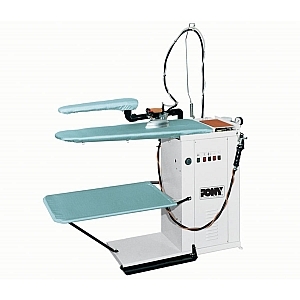 This universal ironing tables is an excellent solution for general ironing. This benefit from all the features of an industrially manufactured table by offering reliability and excellent results but at a highly competitive price. Solutions include domestic and commercial Ironing services, Launderers, Domestic applications or even Dry Cleaners who require a back up finishing solution or keenly priced additional finishing table. With live steam from the steam electric iron and a powerful vacuum, all manner of cottons, linens, woolens and general textiles can be expertly finished with the minimum of effort.